Palm trees evoke warm, sunny beaches, a blissful vacation and coconuts. 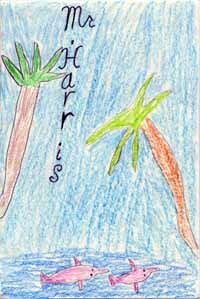 But palm trees are so much more, something children recognize. Palm trees have hundreds of uses and many kinds of wildlife depend on palms for food and shelter. 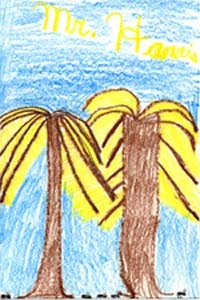 Bright yellow leaves emphasize the characteristic shape of the palm. Two palms hang over a river in which two pink dolphins are swimming.